Mohammed Al Halengy is from Eastern Sudan. He came to the UK in 2006 to flee persecution as he is a member of the Beja tribe, a marginalised ethnic group in East Sudan. This group has struggled for a federal system, equal wealth and power sharing, development and an end to marginalization. However, the catastrophic situation in Eastern Sudan receives little awareness from the international community. The Port Sudan massacre in 2005 during which 22 Beja citizens were shot dead, and more than 400 injured, including women and children, is one example of these atrocities. This was a gross violation of human rights and particularly highlighted the plight of the Beja community in Eastern Sudan. · Mohammed Al Halengy was repeatedly arrested and detained in Sudan because of his standing as a leader in the Beja community. · He was also severely beaten and tortured whilst held in detention and was burnt with a hot metal object on his back and legs. · Mohammed has been examined by medical professionals and has been diagnosed with Post Traumatic Stress Disorder (PTSD). · He is also suffering from severe mental health problems including anxiety flashbacks and nightmares. · Mohammed had to leave his wife behind in East Sudan and is very concerned for her safety. For further information about this campaign and to offer your support please contact Dr Abu Amna on 07440390812 or find us on Facebook at Beja Congress UK. See also Beja Congress on RAPAR. In a cramped Starbucks near a shopping centre in Shepherd’s Bush, a Sudanese woman talked over coffee and cake with a fellow dissident from her homeland. Months later, Saira Ahmed was confronted with pictures of the west London encounter by Sudanese officials who had detained her at Khartoum airport. She was held at the end of a two-week trip to the rebellious desert region of Darfur. Her five-day ordeal at the hands of Sudanese officials led her to fear she would lose the baby she was carrying. During the ordeal last year, Mrs Ahmed (not her real name) was taken to a detention centre several miles from Khartoum airport. In many respects it resembled a spacious villa and was filled with men smoking cigarettes. She was locked in one of the bedrooms with bars on the window and a hard mattress for a bed. Questioning sessions over the first two days lasted for 12 hours. Then for the next three days, Mrs Ahmed was set a number of arduous physical tasks, cleaning the rambling residence and moving furniture. “I was five months pregnant and they knew this. They had questioned me night and day and given me very little to eat,” she told The Telegraph. “Then they ordered me to start cleaning and stopped asking questions. 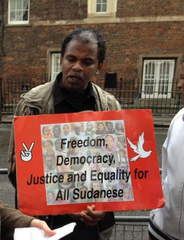 The Sudanese embassy refused to comment on the allegations, but one Sudanese opposition activist told the pressure group Waging Peace that the regime was abusing the asylum system to gain access to the UK. “Sadly some of these people have been unwittingly supported by some refugee organisations and by our community,” the activist said. “Some of them are well known to us by their crimes against our people in Sudan whereas some hide themselves in cities across the UK so that they cannot be identified by our community.” Thousands of Sudanese have gained asylum in Britain as a result of the brutality of Sudan’s National Congress Party (NCP) dictatorship. Activists claim the regime maintains an active web of spies in London and other British cities that have become centres of opposition to the regime. >>> What’s next for asylum-seekers from war-torn Sudan? Adam Mohammed Abdullah’s flight from the war in Sudan started on a camel and ended in Britain, hidden in the back of a refrigerated lorry. Nearly 10 years later – after five periods of detention, no work, little money or hope – he is living in a house in Leicester with three other asylum-seekers awaiting a decision on his future. While he remains in limbo, his family are still at home, including the daughter born 11 years ago whom he has never seen. It is a potential fate that awaits new members of one of the fastest-growing groups of asylum-seekers to Britain from Sudan, which is embroiled in fresh fighting after the vicious campaign of ethnic cleansing in the western region of Darfur that forced Adam, now aged 40, to flee in 2003. And they are employing desperate measures to get here. Just this week, three suspected illegal immigrants were arrested after being seen falling from underneath a lorry in the Midlands. Another 25 were found yesterday in the back of a lorry near Dover. And one 18-year-old Sudanese man was pictured earlier this week seated forlornly after being found after he emerged from underneath a motorhome after tying himself to the chassis and travelling from France. The unnamed teenager was arrested by police and held by Immigration Enforcement. If he claims asylum, he could be detained while he seeks refugee status and a five-year leave to remain in the country. Less than a third of applicants have been granted refugee status in recent years, according to analysis of Home Office figures by the Refugee Council. “Many Sudanese who come to the UK are escaping the very worst kinds of human rights abuses in their home country,” said Olivia Warham, director of Waging Peace, a human rights organisation focused on Sudan. “This forces them to take desperate measures to seek sanctuary here. Figures released under the Freedom of Information Act last month revealed that more than 19,000 stowaways were seized in the 12 months to May this year, a 60 per cent increase on the previous year. Thousands from troublespots in Africa and the Middle East have camped in makeshift tents at Calais, as they prepare to make the final leg of their journey to Britain. It is a journey that Adam made after seeing “more than 100 people die in front of my face” during fighting in Darfur. He to travelled north-west and crossed into Libya, where he spent months holed up on a farm fearful of arrest. He reached Europe in the hold of a small boat to Italy, and made his way up through France. At Calais, he hid in the back of a lorry while the driver took a nap, before emerging in the UK and reporting at a police station. "The human rights situation in Sudan deteriorated significantly between April and June 2013." The human rights situation in Sudan deteriorated significantly between April and June 2013 largely due to escalating conflict and insecurity. Fighting between the government of Sudan and the Sudan Revolutionary Front (SRF) intensified with a major attack by the SRF at the end of April on the towns of Umm Rawaba in North Kordofan and Abu Karshola in South Kordofan. According to OCHA figures, 63,000 people were displaced in this fighting. There are reports from local human rights groups that SRF soldiers looted the towns and killed an unknown number of civilians. In June, SRF forces shelled the state capital of Kadugli on a number of occasions hitting a UN compound and killing a UN peacekeeper and also hitting a local football stadium that was hosting a regional tournament. FCO Minister Simmonds made a statement condemning the attack. Meanwhile, Sudan Armed Forces continued their campaign of aerial bombardment in South Kordofan and Blue Nile with credible reports that civilian settlements were affected. Human rights groups have also reported that the government of Sudan continues to detain without charge civilians suspected to be members of the Sudan People’s Liberation Movement-North in the government-held areas in South Kordofan and Blue Nile. OCHA now assess that the number of those affected or displaced by conflict in the two borderstates may be as high as 907,000 in South Kordofan and 158,000 in Blue Nile, although it is impossible to verify these figures without independent access to the areas. OCHA also report that there are now 223,000 Sudanese refugees in South Sudan and Ethiopia who fled the conflict in South Kordofan and Blue Nile. In Abyei, on May 4, the Paramount Chief of Dinka Ngok, Kuol Deng Majok, and a United Nations Interim Security Force for Abyei (UNISFA) peacekeeper were killed when armed men attacked their convoy in the area of Baloom. FCO Minister Simmonds issued a statement expressing deep concern and urging restraint on all sides. In Darfur, worsening insecurity led to massive displacements with OCHA estimating that there have been over 300,000 new IDPs since the beginning of the year, including 27,000 refugees who fled to Chad and 3,500 who have fled to the Central African Republic. This was driven by a number of factors, including inter-communal fighting over resources and clashes between government and armed movement forces, particularly in parts of Northern, Southern and Central Darfur. Access to people affected by conflict in Darfur remains constrained due to the government of Sudan’s new Directives for Humanitarian Work issued in March, under which access by international humanitarian organisations and their staff to conflict areas is fully restricted. There were no real improvements on political and civil rights in this reporting period. On 1 April, President Bashir made a positive speech calling for national dialogue with all opposition forces and ordering the release of some political detainees. But there has been no further progress on implementation of this new approach. Furthermore, Vice-President Taha issued a directive to lift pre-publication censorship on newspapers. However, since his directive, security services have temporarily suspended at least three newspapers due to their reporting. A further concerning development was the case of three men sentenced to amputations of the hand for theft in a court in El Fasher, North Darfur, in June. The sentences have not yet been carried out. Human rights organisations also report that in June, a female student was fined for wearing trousers by a public order court in Khartoum. Religious freedoms have come under threat with evidence of a trend towards religious intolerance. Since September 2012, at least 215 foreign Christians have been expelled from Sudan with some having their assets in-country confiscated by security services. There are also many examples of Sudanese and South Sudanese Christians being harassed and sometimes detained by security services and some church premises closed down or demolished. FCO officials have raised strong concerns about this trend with senior interlocutors in the government of Sudan. The UN Independent Expert on Human Rights in Sudan, Professor Mashood Baderin, visited the country from 16th – 19th June. The government of Sudan offered cooperation during his visit and he travelled to the state capitals in South Darfur and Blue Nile and to parts of North Kordofan. British Embassy officials met the Independent Expert during his visit to feed in views ahead of his report to the UN Human Rights Council in September 2013. Eastern Sudan is one of the most marginalized regions in the country. Rates of malnutrition, anemia, tuberculosis, infant mortality rates are by far the highest in the world according to data from unicef and NGOs. The Beja Congress (BC), the political party of the people, entered in 1994 an open armed struggle against the regime in Khartoum. In 2006 a peace agreement, called Eastern Sudan Peace agreement (ESPA), has been signed between the Beja Congress and the government of Sudan under the mediation of the Eritrean government. The government promised to grant the Beja people proper share of power at the central and regional levels, to carry out development and reconstruction schemes, and to absorb the ex-combatants into civil military services. None of these obligations has been fulfilled. The humanitarian situation in Eastern Sudan is very grave. The people are suffering from a famine right now. Even drinking water is very scarce. Rates of malnutrition went still higher. As their problems have not been solved, the demobilized Beja Congress fighters entered a sitting strike in front of the Office of Disarmament, Demobilization and Reintegration in Port Sudan. The strike entered its fourth week and the government is just neglecting it totally. It forgot its obligations for reintegration and absorbing them in the society. The ESPA did not help the Beja people. The ex fighters feel betrayed and they do not conceal their desire to resume their struggle to fulfill the anticipation of the people. They have overwhelming sympathy with the struggle carried out by the Sudanese Revolutionary Front in Darfur, South Kordofan and Blue Nile regions. They are eager for an eastern front to open. 2. find ways to deliver urgent humanitarian aid to the starving civilians in eastern Sudan, the Nuba mountains, Darfur and Blue Nile. 3. return of the expelled foreign aid groups to these regions and to eastern Sudan. 4. push the government of Sudan to respect the UN human rights declarations. We, members of the Beja Congress (BC) in the UK, condemn the brutal assault carried out by the security forces in the city of Gedaref in eastern Sudan against peaceful demonstrators protesting against fake elections of the Governor of the state, where the ruling party brought their own candidate with a falsified result that he he obtained 86.6 % of the votes. Human rights activists in Gegaref confirm that the percent of the people who actually voted did not exceed 10%. The people of Gedaref had decided to boycott the elections, because the prefabricated result is known already. Immediately after the announcement of the result, protesting mass demonstrations broke out in the streets, demanding the overthrow of the regime. Several human rights activists were detained and were subjected to cruel torture by the security forces. The BC in the UK strongly condemns the use of violence and torture against the political detainees, and demands their immediate release. The regime in Sudan is violating human rights in the country continuously. The BC in the UK appeals to all democratic organizations to express their solidarity with the Sudanese people and condemn the violation of basic human rights in Sudan, and help bringing President Bashir, accused of committing war crimes, genocide and ethnic cleansing, to the International Criminal Court. Over forty people turned out to support Mohammed Al Halengy at his immigration tribunal hearing on Wednesday morning 07/11/12. 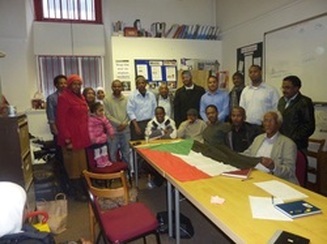 All the people present illustrated the huge amount of campaigning Mohammed is involved in around the Beja community here in Manchester and the national network of Sudanese along with his role as part of RAPAR's leadership group. 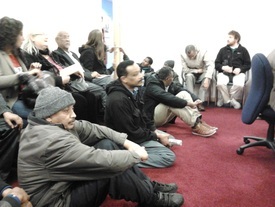 Around twenty-eight people eventually squeezed into the actual hearing to listen to Mohammed's barrister tell his life story. At times the impact of hearing about the situation in Sudan was visibly emotional, especially for those from the region who are also facing a similar situation to Mohammed. The people who were not able to be in the hearing room gathered outside the building - click here to watch the video of them. Mohammed Al Halengy is a member of our leadership group and also a key leader of Beja Congress UK. He provides effective help and support to Sudanese people. He also leads the Beja Solidarity Campaign for RAPAR. An Upper Tribunal hearing will be held to determine his right to stay in the UK on Wednesday November 7th at 10am. RAPAR is now organising a vigil to support him outside the court. Please assemble from 9:30am onwards at Piccadilly Exchange, 1st Floor Piccadilly Exchange, 2 Piccadilly Plaza, Mosley Street, Manchester, M1 4AH. Click here to download the leaflet for this event. A demonstration was organised and attended by the activists and supporters of all Sudanese political parties in London on June 30, 2012. 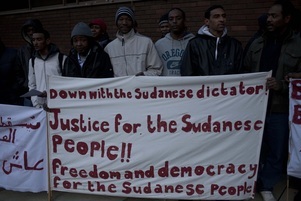 The Sudanese who oppose to Omar-Al-Bashir regime for his dictatorship and aim to take him to International Crime Court. click here to see the photos from this demonstration. A group of people from the Sudanese diaspora in Manchester gathered on Friday (24/02/2012) in front of the BBC buildings, to protest against severe human rights violations by the dictatorship in Sudan. These violations include: arrests, censorship and the systematic torture, murder, starvation and genocide of the people of Port Sudan, the Nuba mountains and Blue Nile regions. They demanded the downfall of the current regime led by Dictator El Bashir and called for him to be tried by the international criminal court (ICC.) The demonstrators chanted slogans and sang revolutionary songs in English and Arabic. Mohammed Al Halengy, secretary of the Sudanese Beja Solidarity group, said ‘we will continue to draw attention to the corrupt system in Sudan and I would urge all the Sudanese people to unite against the opposition, and work together to construct a Sudan that is more just and democratic’.